END OF ICE FISHING SALES: ION 8" Electric Power Auger $399.00 Only one available. 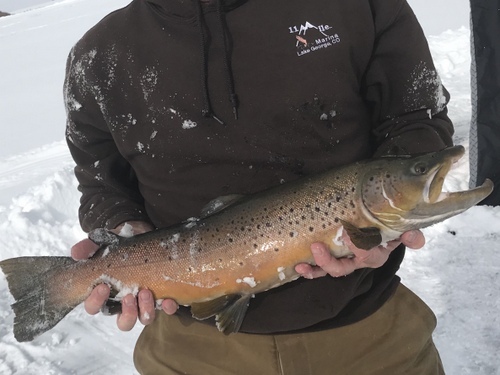 FISHING REPORT PHOTO CONTEST WINNER: Marissa caught this award winning Brown and took the pic while team player Brian held the fish. There were nothing but great pictures sent in this Winter and we want to thank and congratulate everyone that sent them in and got chosen for the Report. The judges had a hard time but in the end “product placement” with that fine hooded sweatshirt in conjunction with a trophy Brown tipped the scales. $100.00 store credit for these winners! CONDITIONS:: Park is open 24/7/365. Lake is 97% ice capped. Ice thickness running 5 to 17 inches. The edges are going in many spots but you can still get on the ice particularly on the East end of the lake if you want. No real shore fishing opportunities yet. Open water at inlet area barely to Cross Creek. If you go ice fishing please use extreme caution. Stay away from rocks as those are very soft areas. Don’t go alone and bring appropriate safety gear. It’s going to be a late ice off for sure. MARINA STORE AND LAKE SPECIALISTS: Camping, Fishing, Flies, Lures, Bait, Clothing, Food, Snacks, Drinks, Ice Cream and more. Stop in and check out our offerings and get the latest fishing information. We have a great store with great selection of what works. Support the fishing report... Shop our store here at the lake. Stop in and find out how we can help you catch. Get a topo map. They say information is power. It's also critical to catching fish. The maps have GPS coordinates on them so you just can't miss. We want you to be successful here at the Mile. TROUT GOOD: Action is good for those that want to take the chance. KOKANEE SALMON:VERY GOOD: Early on early off is the slogan if you want to head out.